No matter what skills and experience you have, The Little Forks Conservancy can always use a helping hand! Whether it's planting native species, removing invasive species, or maintaining a preserve's trails, your help is greatly appreciated. 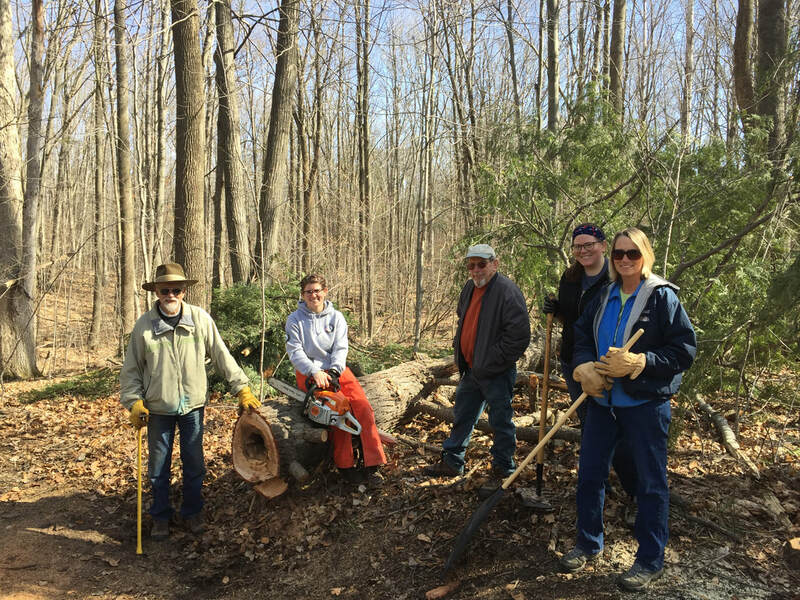 In 2018, volunteers contributed over 940 hours of their time to help with events, trail work, plantings, and invasive species removal. What will you do to help this year? In 2019, we aim to complete projects including building boardwalks and trails, removing invasive species, restoring the land to native species, and much more! An orientation to Little Forks will be offered in February of each year. 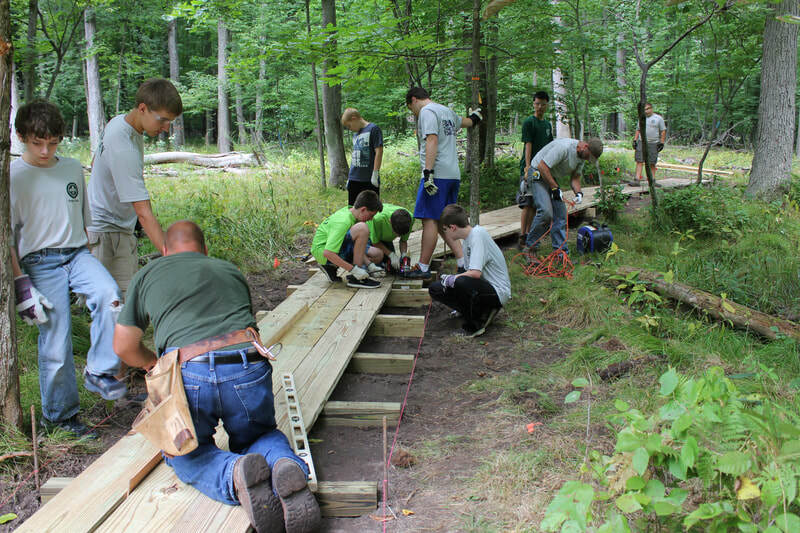 Preserve Stewards – Volunteers attend workdays scheduled by the Stewardship Coordinator working on constructing boardwalks, building and maintaining trails, cutting invasive species, and more! Preserve Stewards are encouraged to attend a minimum of 4 workdays in the year! In addition to attending workdays, Preserve Stewards are encouraged to hit the trails after a storm has passed through to toss debris off the trail and report any damage such as fallen trees. Preserve Stewards are invited to workshops and training to expand their skill set and have to opportunity to become leaders during workdays. Stream Monitors – Little Forks’ Stream Sampling event is held twice a year on a Saturday and the following Monday night in May and September. 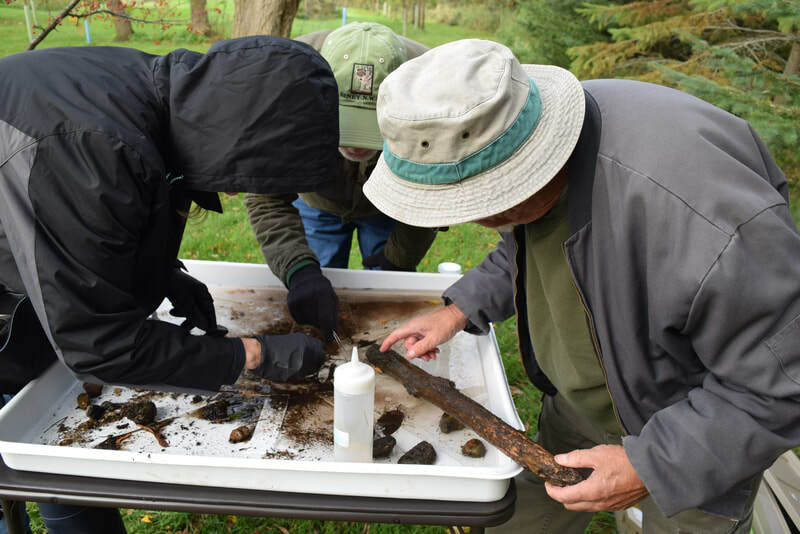 The Group meets in Gladwin County and divides into groups of 4-6 people to collect macro-invertebrates from the Cedar River. This is a kid-friendly task. Adults are encouraged to attend the yearly Stream Leader Training to become a collector or stream leader – Check out the stream sampling page for more information! Vernal Pool Monitors – Volunteers must attend a training in March to learn the protocol. Vernal pool monitors will “adopt” 1-3 vernal pools to sample three times a year; twice in the spring and once in the fall – materials are provided. Kids 10+ year old can participate when accompanied by an adult. LFC Ambassadors – Volunteers can attend an orientation to learn more about the organization and programs such as Land Protection, Nature/Nurture, Stewardship Series, and more. Ambassadors will be given packets with pamphlets and swag so they can help us spread the word about the work done by The Little Forks Conservancy. Ambassadors are encouraged to talk about Little Forks to individuals and will likely be asked to help at tabling events. Preserve Monitor – Little Forks Conservancy has 5 Nature Preserves open to the public and we need volunteers to walk the property three times a year and using an app on a smartphone to submit a form and a few pictures. A how-to page will be provided to individuals and access to the app. If office related or event work interests you check “anything to help”! Unsure of what role is right for you? Thinking of a new role we are missing? Contact Sara.